What’s wrong with these headlines? Well, for one, they contradict each other. 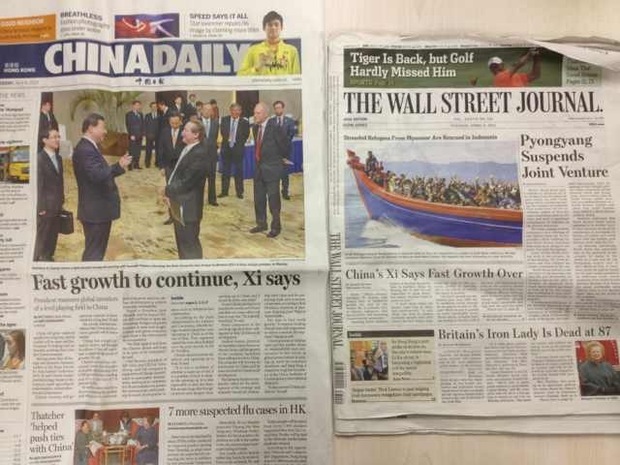 Unless Xi Jinping can’t remember what he just said, one of these news publications is grossly exaggerating. But which one? And perhaps his is right. Unless you enjoy your daily news with a side of reporter’s two cents. Is either headline real…or is “real” a matter of opinion? Are journalists, bloggers, and reporters supposed to tell “the truth”–should we rely on them to do so like a doctor taking the Hippocratic Oath to practice ethically and honestly–or are they only bound to telling their version of the truth? Is there a difference between their truths and the truth or are some “purported truths” just plain false? A cursory glance at the BBC Africa page shows the kinds of “truths” the organization puts forth about Africa. If this news was representative of the occurrences in Africa, it would seem as if violence is a constant force in everyday life, which I am sure many Africans can attest that is not the case. But how many thousands, even millions, of Africans turn to BBC for their daily dose of “news” each day? Maybe it’s time to reiterate that you should get more than one newspaper. More than two, even. Perhaps in comparing more and more “truths,” we can arrive at a greater truth. But it’s equally possible that seeking some semblance of truth–whether in China or in the U.S.–in any news at all, may in itself be an act in futility. I think we will be lying if we thought that any news was indeed the truth. We all must have our versions of it. However sometimes, when someone’s Vern’s tends to appease a particular interest most of the time, it is safe in branding such news propaganda. What we must look out for is news that tends to be inclusive on diverse opinion, perhaps not in the same article but across the board. Better news organizations like I am beginning to see here have writers with very diverse opinions, sometimes even at one another’s throats about the facts. Thanks. Nice point, Marck. Diverse opinions are definitely needed. Though we may not all agree, we should embrace debate.